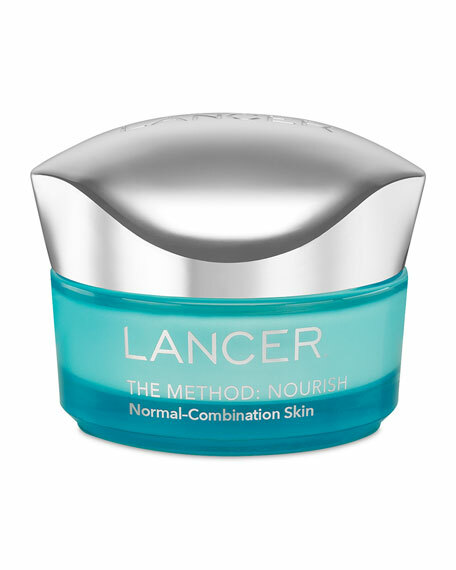 The Method: Nourish is the last step of The Lancer Method, Dr. Harold Lancer's signature regimen of daily exfoliation, cleansing and nourishing the skin. Formulated for those with normal or combination skin types, this product should be used after Polish and Cleanse for optimal results. Together, the three steps of the Lancer Method dramatically improve the appearance of fine lines, texture, discoloration, and pore size, revealing a radiant, younger-looking complexion. Apply a small amount of product on your fingertips and gently massage over the face, neck and décolleté in small circular motions. During the day, follow with Sheer Fluid Sun Shield SPF 30 (sold separately). Water/Aqua/Eau, Caprylic/Capric Triglyceride, Glycerin, Dimethicone, C12-15 Alkyl Benzoate, Butyrospermum Parkii (Shea) Butter, Propanediol, Squalane, Cetyl Alcohol, Glyceryl Stearate, PEG-100 Stearate, Stearic Acid, Cetyl Phosphate, Dimethicone Crosspolymer, Vitis Vinifera (Grape) Juice Extract, Tropaeolum Majus Extract, Persea Gratissima (Avocado) Oil, Olea Europaea (Olive) Fruit Oil, Hydrolyzed Rice Protein, Hexapeptide-48 HCl, Dipotassium Glycyrrhizate, Phytosterols, Raspberry Seed Oil/Tocopheryl Succinate Aminopropanediol Esters, Phospholipids, Hyaluronic Acid, Polymethylsilsesquioxane , Carbomer, Xanthan Gum, Ascorbyl Palmitate, Tocopheryl Acetate, Disodium EDTA, Aminomethyl Propanol, Sorbitan Oleate, Pentylene Glycol, Caprylyl Glycol, Chlorphenesin, Ethylhexylglycerin, Phenoxyethanol, Citric Acid, Fragrance (Parfum), Limonene, Alpha-Isomethyl Ionone, Linalool, Hexyl Cinnamal. A new category of moisturizer—the moisturizing qualities and nutrients of a rich creme in a refreshing, fast penetrating, fluid-like texture. Clinique Turnaround Overnight Revitalizing Moisturizer, 1.7 oz.